In moments where ranchers’ calves become sick, the only way for them to reach and treat their livestock is to rope and tie them down for medical treatment. Formerly known as calf-roping, tie-down roping originated during the days of the Old West. As ranchers roped calves faster and faster, ranchers soon made this chore into a competition. As this ranch chore grew in popularity, the Professional Rodeo Cowboy Association turned tie-down roping into one of its seven traditional rodeo events. However, unlike what you might find on the ranch, this timed event requires not only roping skill, but extraordinary teamwork between the cowboy and his horse. On one side of the arena, a calf is loaded into a chute while the tie-down waits on the right side of the chute. Just like in team roping and steer wrestling, the calf is given a head start with one end of the breakaway rope barrier looped around the calf’s neck and stretched across the open end of the box as horse and rider wait behind a barrier. When the calf reaches its advantage point, the barrier is released, and the chase is on. However, if the barrier is broken before fully being dropped, a 10-second penalty is added to the contestant’s time. As the cowboy runs after the calf, they must rope it around its neck, get off their horse and flank the calf, otherwise known as picking it up and laying it on the ground. As the cowboy does all of this, their horse maintains enough tension on the rope (without dragging the calf) to help keep the calf from running away. When the calf is on the ground, the cowboy must tie any three of the animal’s legs together using “piggin’ string,” which he carries in his teeth until needed. When the cowboy completes his tie, he throws his hands in the air as a signal to the judge and timing is stopped. The cowboy then remounts his horse, allowing the catch rope to slacken. If the calf kicks out within 6-seconds, the run is invalid, and the contestant receives a no time. After the cowboy successfully ropes the calf, he must jump off his horse and run down the rope to tie the calf. 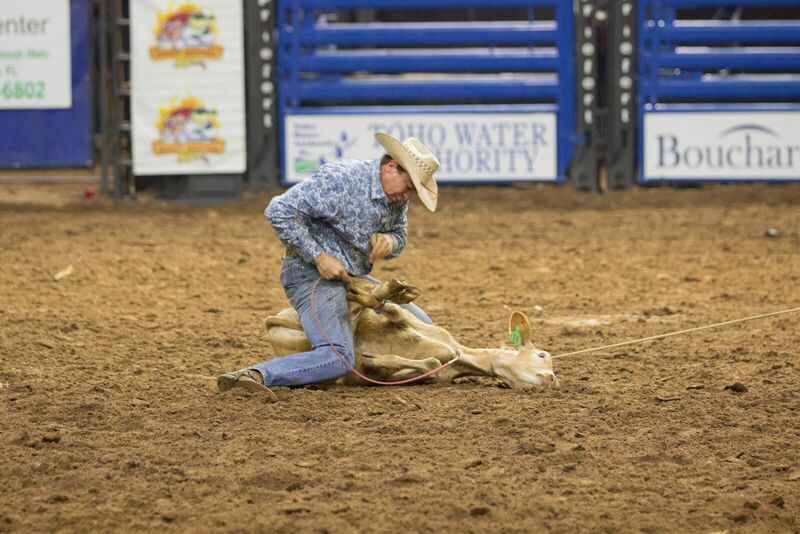 Once the calf is lying on the ground, the cowboy must quickly tie three of calf's leg together.